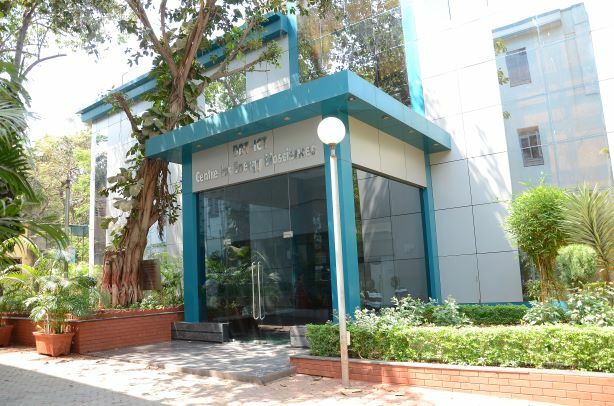 The DBT-ICT Centre for Energy Biosciences (DBT-ICT-CEB) is a unique place that integrates basic and translational science capabilities for bioprocess development and scale up. Funded by the Department of Biotechnology, Ministry of Science and Technology, India, the Centre was established and formally inaugurated in May 2009. Established at a total cumulative cost equivalent to more than USD 15 million, the Centre is a part of the Institute of Chemical Technology (ICT) at Matunga, Mumbai, which is a deemed University under Section 3 of UGC Act 1956. The Centre was set up as a result of vision and efforts of Dr. M. K. Bhan, Secretary DBT and Dr. Renu Swarup, Advisor, DBT, and functions under the leadership of Dr. G. D. Yadav, Vice Chancellor, ICT. The projects and technical programs at the Centre are coordinated by Prof. Arvind Lali. The Centre is focused primarily at developing biotechnologies for deriving biofuels and other products from renewable resources for reducing India’s rising dependence on petroleum and cut down greenhouse gas emissions. The Centre believes in building multidisciplinary capacity for development of integrated technology packages. The Centre successfully completed its first phase of five years in 2013 and was awarded an extension of five years by the Department of Biotechnology with the extended mandate of upscaling and upgrading the platform technologies developed during the first phase. The 10 Ton/day biomass pilot plant set up by Industry has successfully validated all segments of the novel DBT-ICT Lignocellulosic Ethanol Technology in a continuous non-stop flow mode from biomass size reduction to ethanol fermentation. The technology is at present being taken to commercial scales by different oil marketing companies. 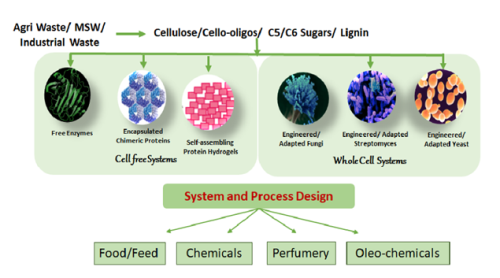 The Centre has developed a highly competent working groups in the area of Synthetic biology, Fermentation technology, Green/Chemical catalysis, Algal technologies, Enzyme engineering & technology, Separation technologies. These groups have developed a range of globally competitive cutting edge technologies that are at present being translated to demonstration and commercial scale plants. 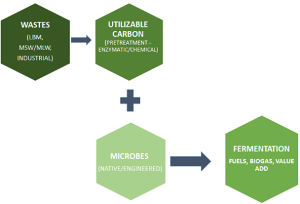 With an outstanding achievement in the first phase, the second phase progressed to develop platform technologies for conversion of all domestic, industrial and agricultural wastes to renewable products (fuel, food, feed, material, energy and chemicals) using smart combinations of chemical and biological technologies. 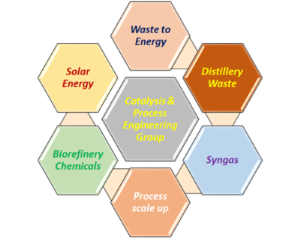 Also during the second phase, the Centre has developed an integrated biorefinery concept through multi-product processing using chemical or biological routes that are being taken up for technology transfer or scaleup. The Centre has expanded its state-of-art facility and procured several high-end equipment’s and instruments that not only leads to high level contemporary research but also an accelerated development of several more scalable technologies based on the knowledge base generated. The Centre having completed its second phase in 2018, aims to continue the work in an intensive mission mode for innovative research and translation of developed technologies. The Centre for Energy Biosciences has attracted a large number of industrial and academic collaborations as a result of its reputation of conducting cutting edge research and delivering viable and scalable solutions to the biotech industry. The Centre is also part of several national and international academic collaborations (Indo-UK, Indo-Australia, Indo-German, Indo-US and several national projects) with grants amounting to more than 10 million USD under various R&D schemes floated by Ministry of Science and Technology, Government of India. The technologies developed at the DBT-ICT Centre have been secured through patent filings across the world. 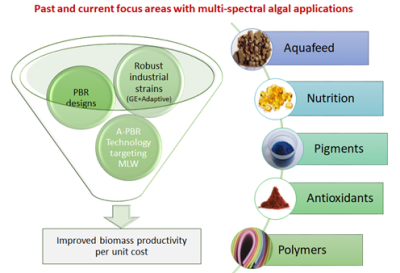 A number of technologies have been already licensed to industries for pilot and commercial scale plants.